The first chapter on how to tune the Honda MB and MT50 restricted (Jan 6-19) has caused quite a stir. Some of you want the details, and others don't think we should tell you. Honda UK fall in to the second category. They haven't cut our throats yet, but as you can see from the accompanying letter they are not too pleased with us. As we said in the opening chapter, we donot want anyone to break the law. It's illegal for any 16-year-old to ride a restricted moped which has been performance modified. This tuning seris is aimed at the 17-year-old or older rider who wants to keep his "moped" and legally de-restrict it for a decent level of performance. To carry out the modifications listed in the first chapter you will have to buy a riffler and round file or have your barrel modified professionally to the dimensions suggested. So much metal has to be removed from the constricted ports that to save time on our project bike engineer Colin "Screwloose" Taylor was set to work with milling machinery to raise the exhaust port by 5mm and the transfers by 1.5mm. All ports were radiused i.e. their edges were smoothed using the riffler to prevent the possibility of the rings snagging in the ports. The restrictions in the inlet port were filed away. You can use an electric drill and an abrasive stone to get the bulk of the metal out. 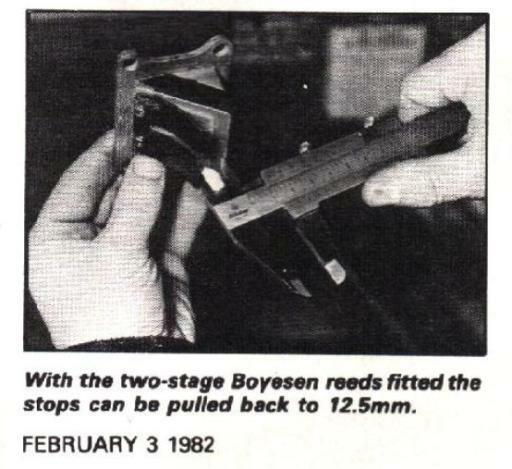 This allowed the reed stops to be opened back from 4.5mm standard to 12.5mm in conjunction with the Boyesen reeds mentioned last time. 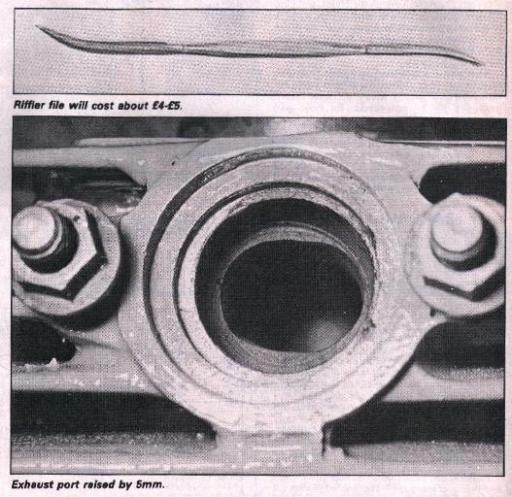 To investigate possible modifications to the exhaust system, "Screwloose" opened the belly of the pipe with a welding torch to find out what was inside. This is obviously designed to limit power. 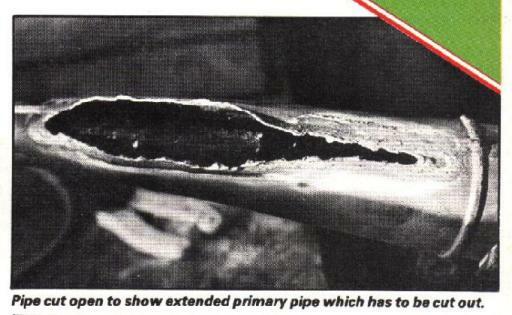 To cut off the extra lengh involves hack sawing the pipe just rearward of where the primary pipe meets the cone. The extra lengh of primary pipe can then be thrown away and the system welded back up. This allows the exhaust gases to expand by following the inside face of the cone. We took out the baffle from the rear of the silencer and after examining it decided to leave it standard for the time being. The head has so far not been touched, but the inlet manifold has been opened out as detailed in diagram E of the first part of the series. This led us to look at the carburettor, which has a tiny 14mm bore. To match it to the inlet manifold meant it would have to be bored out. 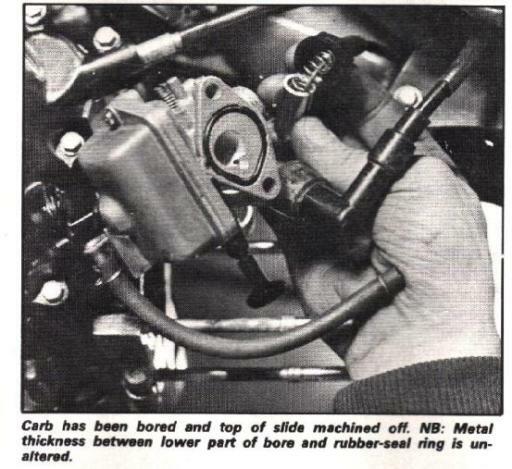 The important consideration here is not to go beyond the width of the carb slide bore otherwise air would be allowed to enter the engine from either side of the slide instead of from below only. The slide bore measures 17mm in diameter and the inlet bore was milled out to just a touch under that measurement. Another important consideration is that the lower face of the inlet bore needs to remain unaltered for jetting purposes so the carb hasto be bored eccentrically. In other words, it is rather similar to raising the exhaust port. A further problem is created as a progression from this. Because the inlet bore has been heightened the bottom edge of the slide remains hanging down on full throttle. This obviously would act as an obstruction to gas flow. The cure is to machine away the top of the slide until the lower edge can be pulled up high enough to be flush with the ceiling of the inlet bore when on full throttle. Now, many of you may not wish to go to the expense of having parts machined, or take the risk of something possibly going wrong. 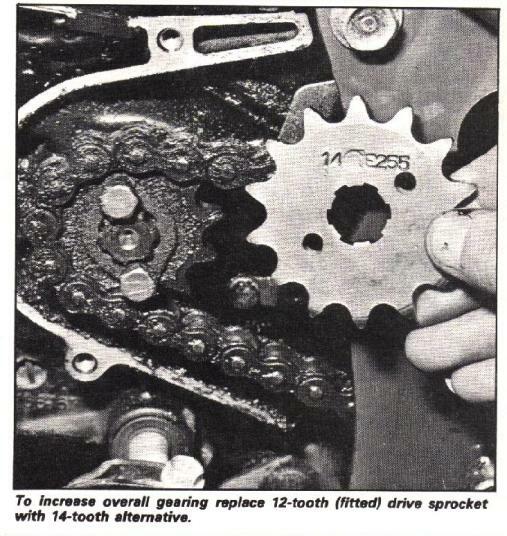 Step 1: Fit a 14-tooth drive sprocket in place of the 12-tooth original. Step 2: Fit the Boyesen reed. While you are at it you might as well invest the £5 or so in a riffler to file away ridges on the inlet port. 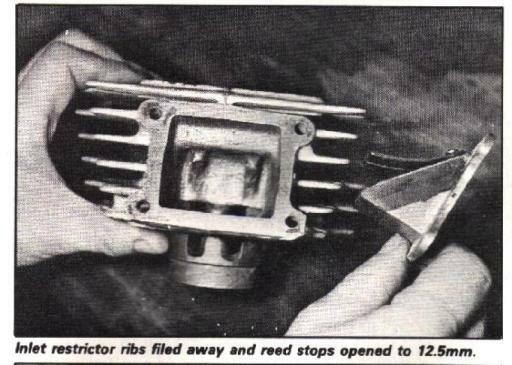 This would allow you to make full use of the new fibre reeds by opening the stops to 12.5mm. That's it for this issue. Next time we are hoping to be able to bring you some speed figures. 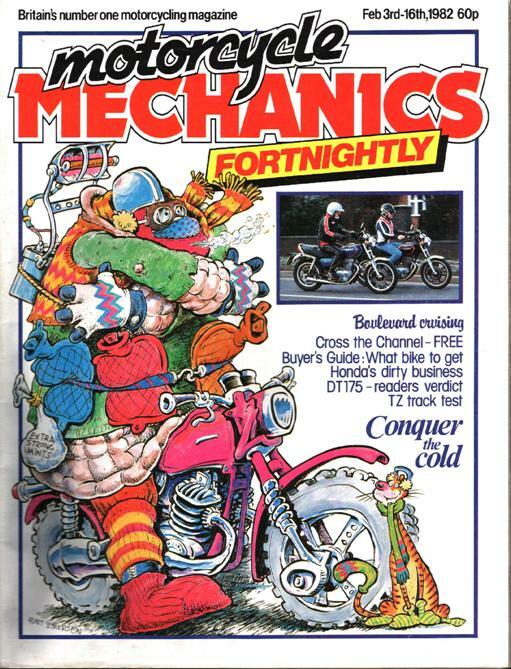 at present we are looking for a double score target - 60 mph top speed instead of the weak-kneed 30 mph the bike was born with. Fingers crossed.